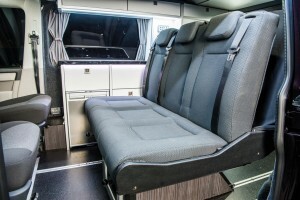 You’ll notice that many campervans only have either a fixed rear seat or one with a small adjustable slide. The problem here is that you can never use the campervan for transporting large items and loads using the rear door. You’ll always have to use the side door. 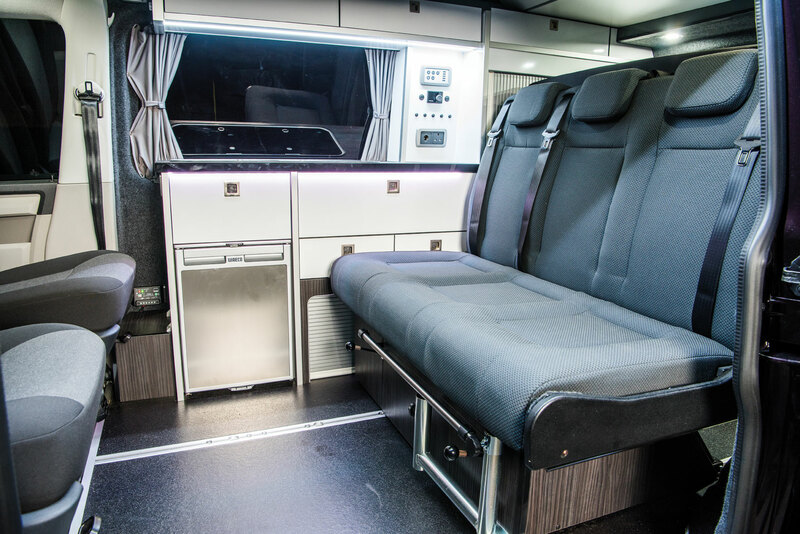 The solution is our Reimo rear sliding seat system that slides the full length of the camper meaning the 3 rear passengers can sit comfortably directly behind the driver if required when on a journey. This leaves a massive load area in the rear to carry everything you need, including bicycles safely and out of the way of the passenger. Then when you arrive at your destination – simply offload the gear and slide the seat to its fully rear position to give you a spacious living area. Another benefit of the full sliding seat is that when eating as a family of 4, just simply slide the seat to its front position, swivel the driver & passenger seats round and you have the perfect social seating position for a meal for 4 or playing your favourite board game. A special feature we have designed is the under seat storage. This slides with the seat and has a front and rear hinged door allowing you to load long items such as ladders, skis or fishing rods straight through without having to lay the seats down. 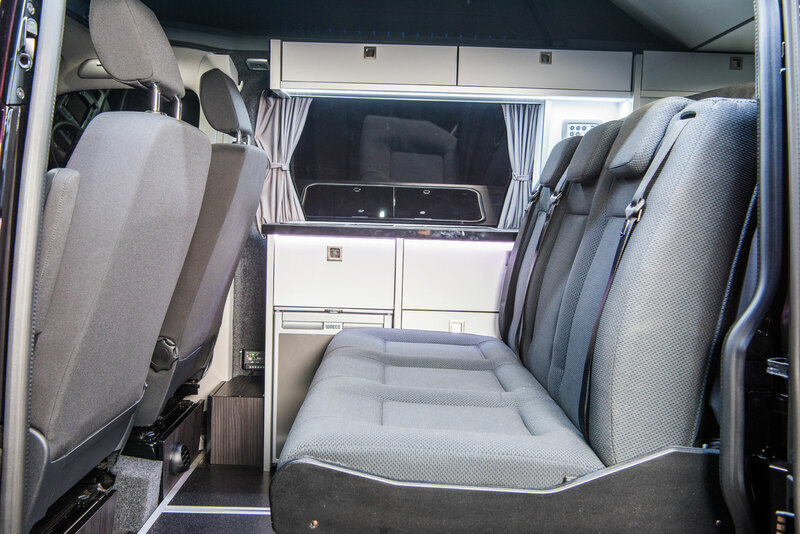 Volksleisure’s sliding seat system is a clear winner for numerous reasons and will transform your campervan making it more versatile in everyday use. We know you’ll love it. It’s simple, Reimo’s variotech 3000 seat and power rail system has the ability to secure the rear seat in multiple locking positions and the option of adding an additional single traveling seats to turn your camper into a 6 seater or 7 seater if you opt for the double front VW passenger seat. 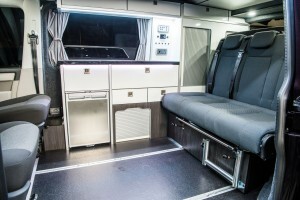 The seat can also be removed completely for those occasions when you wish your campervan was more van than camper! Additional single seats can be fitted to the sliding rail on LWB models. Making your campervan a full 7 seater. When it comes to safety there is no compromise and the Variotech ‘3000’ seat leads the way where many other seats on the market today fall short! The seat has been through in chassis testing and complies to the latest European standards and is one of the only seats on the market which offers 3 seats with integral 3-point belts.